Yesterday was World Diabetes Day. I wasn't aware of it till Swathi of Zesty South Indian Kitchen asked me the other day if I wanted to join her and few other bloggers to spread awareness about diabetes. Though I immediately agreed to join the rest of them, I wasn't sure what to write... I am not a diabetic and thankfully no one in my family is... My father has high blood sugar but he isn't a diabetic. So I couldn't really appreciate the need for a World Diabetic Day until a Google search showed up some alarming facts and statistics associated with diabetes. There are 23.6 million children and adults in the United States who have diabetes. 5.7 million don’t even know they have the disease ! & the disease kills one person every 10 seconds. While the numbers are alarming, one might take some solace in the fact that though not curable, this disease is not a death sentence right away. In many cases type 2 diabetes formerly known as non-insulin-dependent diabetes or adult onset diabetes is preventable and type 1 diabetes formerly known as insulin-dependent or juvenile onset diabetes is manageable. Studies have shown that a change in diet, increase in physical activity and a change in lifestyle can affect the incidence of this disease on individuals. 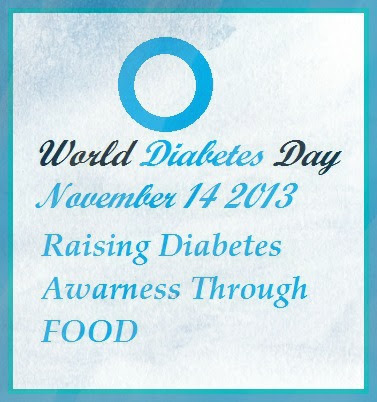 For this reason the UN resolution designated November 14 as World Diabetes Day. The idea was to make people aware of this growing epidemic and motivate them to change their eating habits and lifestyles before the disease gets to them. The recipe is pretty simple.. the usual eggs, milk and flour with a pinch of salt and sugar. 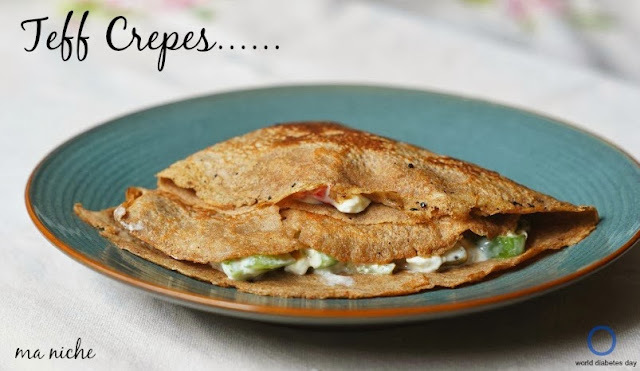 I often make this for breakfast too.. but then i serve it with applesauce and on special occasions with a filling of cottage cheese, sour cream, chopped cucumbers, tomatoes and a sprinkle of Herbs de Provence.. Put all the ingredients in blender and whip to a smooth uniform mixture. Let mixture rest for 10 minutes or so. Grease a large non-stick skillet and heat it over medium high heat. Pour about 1/3 cup of the batter into the center of the pan while tilting and turning it till a circle of batter covers the surface of the pan. Cook till the edges begin to dry and lift off from the sides, about 1 minute or so. Flip using a spatula or your fingers and cook on the other side for 20-30 seconds. Remove from the pan and repeat with the remaining batter adding more oil to the pan when required. 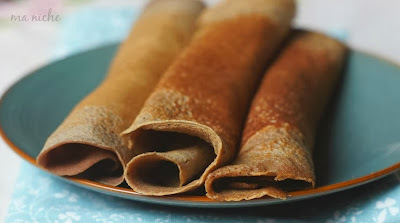 Plate the crepes and serve immediately with a side of your choice..
Visit the following links for more information on Diabetes and activities centered around World Diabetic Day... Medicals facts on diabetes.. its symptoms, causes, tests and complications.. Guide to Diabetes Type 1 and Type 2 Why a World Diabetes Day ? World Diabetic Day Postcard Exchange a project initiated to promote healing through Creativity, Connection, and Activism. 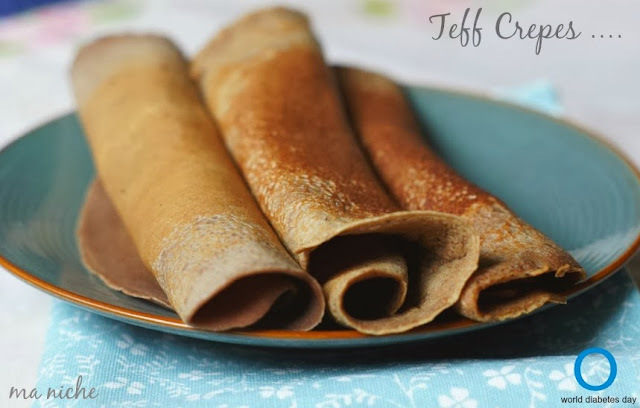 p.s: you can find a quick preview of the goodness of teff here. refer to ethnoMED for more information on teff flour.